Ever since they occupied Aden as a territory in 1839, British troops were subjected to attacks. From 1962, Britain was engaged in an escalating conflict in the protectorate. Using grenades, bombs and rifles supplied by regional and world powers, nationalist groups such as the National Liberation Front (NLF) and the Front for the Liberation of Occupied South Yemen (FLOSY) targeted British troops and their families. By November 1967, the situation was untenable and Britain’s ‘permanent garrison East of Suez’ was abandoned. A foot patrol, of the 1st Battalion, The Kings Own Yorkshire Light Infantry, moving warily through a bazaar in Tawahi, Aden. 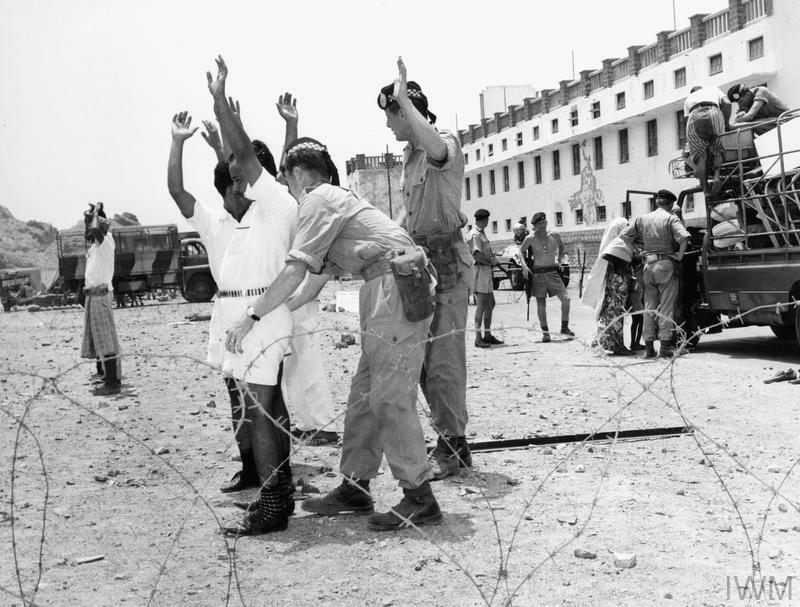 By the early 1960s, security in Aden was increasingly threatened by nationalist groups from within the protectorate and also from neighbouring Yemen. After British humiliation in Suez in 1956, Egypt’s President Nasser supported by the Soviet Union pushed to evict Britain from South Arabia by training and supplying Yemeni tribesmen and nationalist fighters to attack British personnel in Aden. Until 1961, Aden’s defence came from the Aden Protectorate Levies (APL), a local force commanded by the British. This was reformed as the Federal Regular Army (FRA) while the Government Guard became the Federal National Guard (FNG). In June 1967 before independence the FRA merged with the FNG into a single force, the South Arabian Army. The resultant force was increasingly distrusted by the British. In 1963, the Egyptian backed ‘Red Wolves of Radfan’, working with the NLF began an insurgency against British and South Arabian forces in the Radfan region. In response the Federal Regular Army conducted Operation Nutcracker in January 1964 and while initially successful they were unable to hold land secured from the rebels. 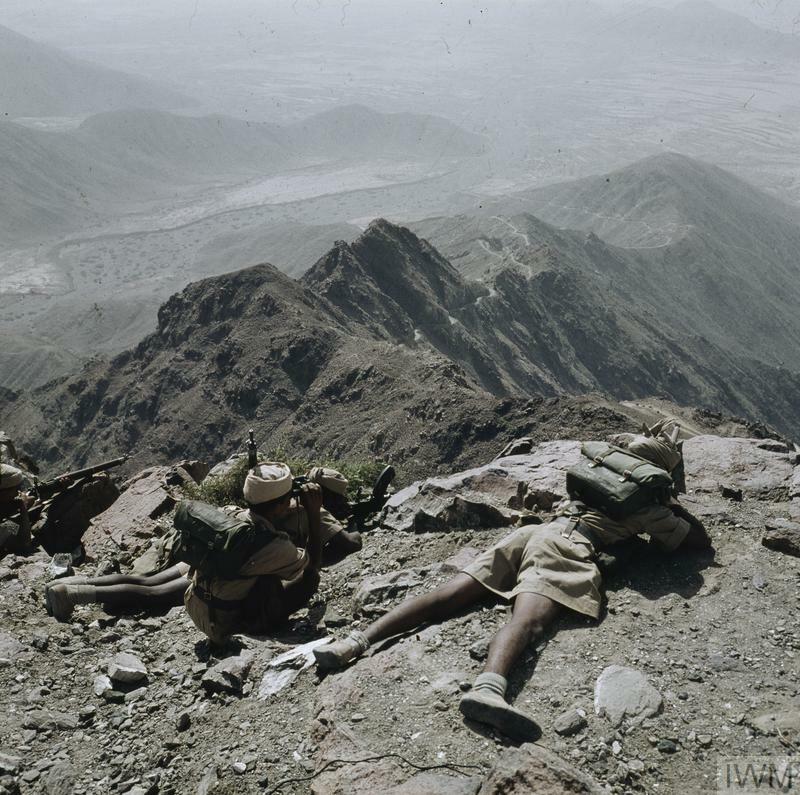 From May to June 1964, a British force known as RADFORCE operating from Thumeir succeeded in pacifying the region, though it was unsuccessful in defeating the wider nationalist threat. The National Liberation Front formed in 1962 as a radical movement aimed at expelling Britain from what they called South Yemen. 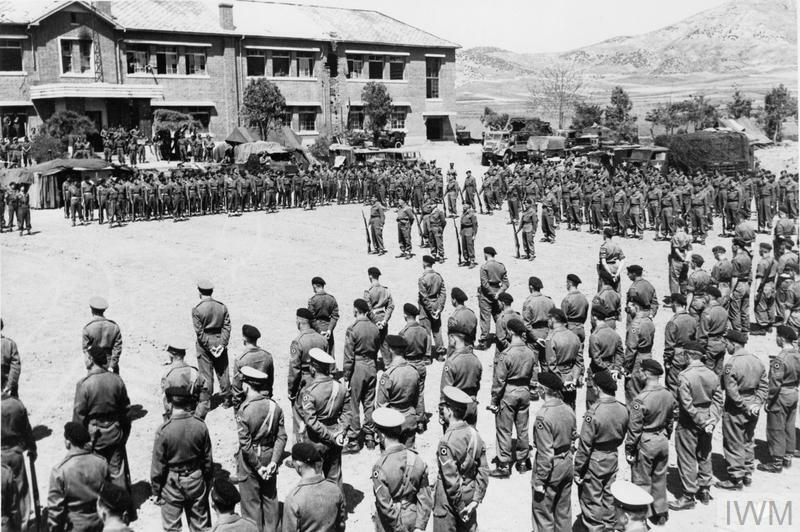 The NLF was organised around a secret cell structure and through this was able to operate in all levels of local government unknown to the British. The Front for the Liberation of Occupied South Yemen was formed in 1966 as an Egyptian attempt to unify nationalist groups. However, elements of the NLF opposed FLOSY creating tensions between the groups. 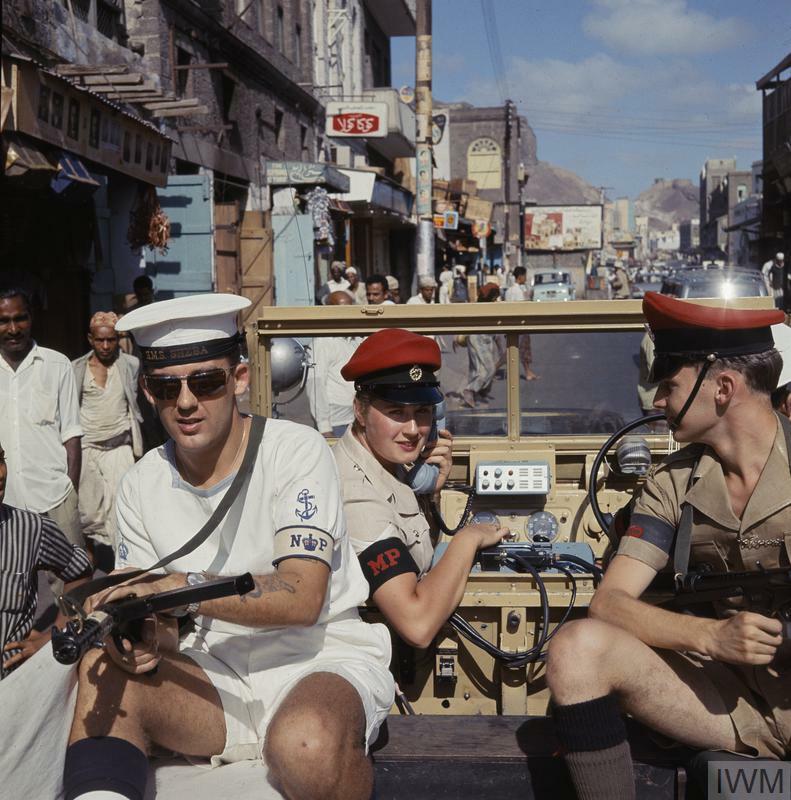 A combined service police patrol in Crater, Aden c 1963. 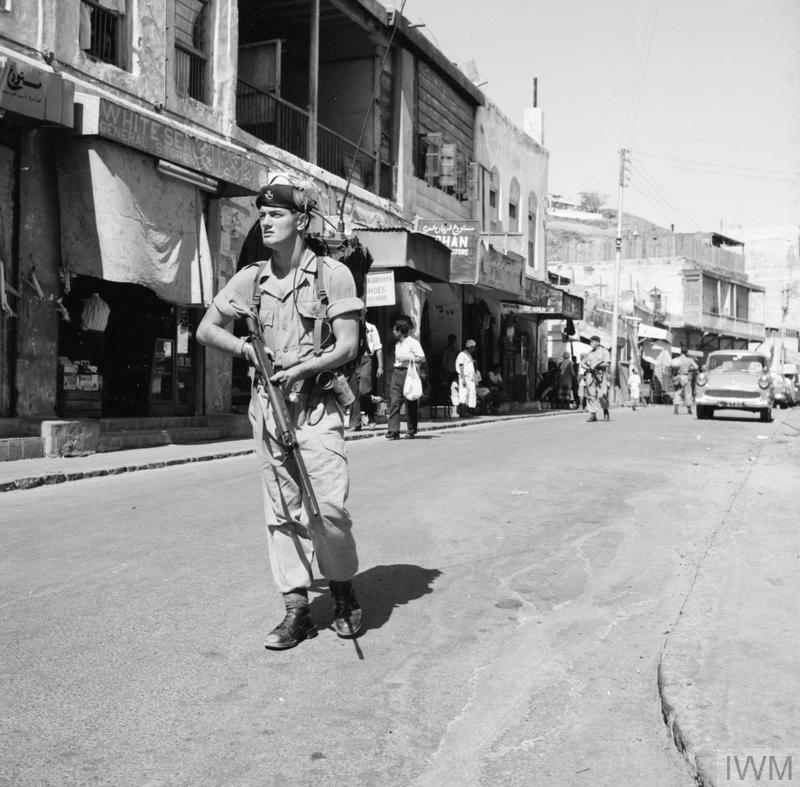 Towards the mid-1960s, British forces increasingly found themselves acting as soldier and policeman within the centre of Aden itself. Stop and search operations were used in order to identify rebels and to prevent the transportation of weapons. Regular patrols of the streets of Aden were conducted, initially on foot but later in armoured cars. The harsh methods used by British soldiers caused resentment by the local community. Patrols were often ambushed and subjected to attacks with rocks. Members of the Argyll and Sutherland Highlanders searching suspects in Aden in 1967. From 1964, the NLF began to conduct terrorist attacks directly against British interests. The campaign was marked by a series of bombings, shootings and grenade attacks on members of the civil administration, military personnel and civilians. British retribution for attacks on soldiers or their families was swift, harsh and often indiscriminate. Whole communities were suspected. Adding to the complexity of policing Aden, the British were also faced with street fighting between the two principal nationalist groups. Fragments of an exploded Soviet F1 anti-personnel grenade, used in Mukeiras, Aden, June 1966. By the time of British withdrawal many South Arabian soldiers and policemen were openly aiding the insurgents. 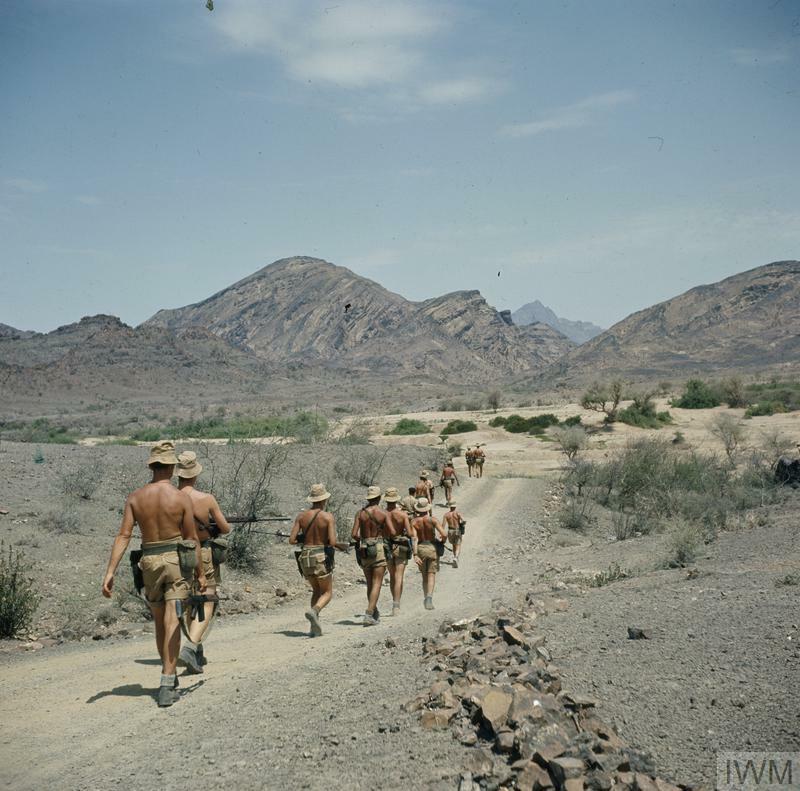 In one example on 20th June 1967, the South Arabian Police attacked British forces in locations across Aden provoked by rumours of a British attack on a South Arabian Army base. In the town of Crater British forces came under widespread and repeated attacks quickly losing operational control of the area. This resulted in a humiliating decision to withdrawal from the area. During the day a total of 22 British soldiers had been killed and 31 wounded. On 3rd July, men of the 1st Battalion, Argyll and Sutherland Highlanders re-occupied Crater. 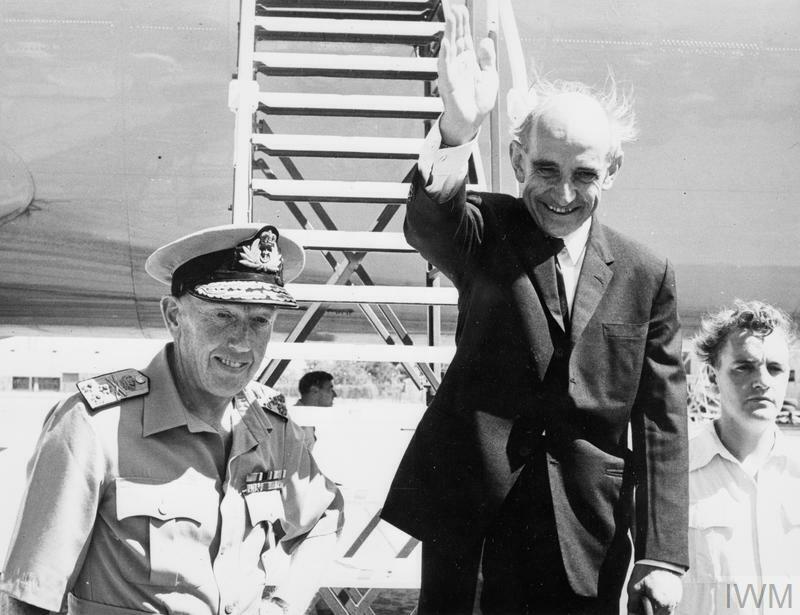 His Excellency Sir Hugh Trevelyan boards an RAF Aircraft at RAF Khormaksar after a short handover ceremony, Nov 28 1967.By June 1967, British forces had withdrawn from the outer parts of the country, with the NLF assuming control as they did so. By August the NLF were in charge in 12 states. The Federal government ceased to exist in September and High Commissioner Trevelyan sought negotiations with the nationalist groups over Britain’s inevitable withdrawal. Yet attacks on British forces by the NLF continued, forcing the quickening of the evacuation. Trevelyan, and therefore British government, left Aden from RAF Khormaksar on 28 November 1967. The Task Force assembled in the Gulf of Aden, prior to the evacuation, November 1967.With civilian government gone a massive task force assembled in the Gulf of Aden in preparation for the withdrawal of the last military units. This task force included Sea Vixen and Buccaneer equipped aircraft carriers, commando carriers, several destroyers, frigates and a submarine, 42 Royal Marine Commando and 1 Para covered the withdrawal before themselves leaving. 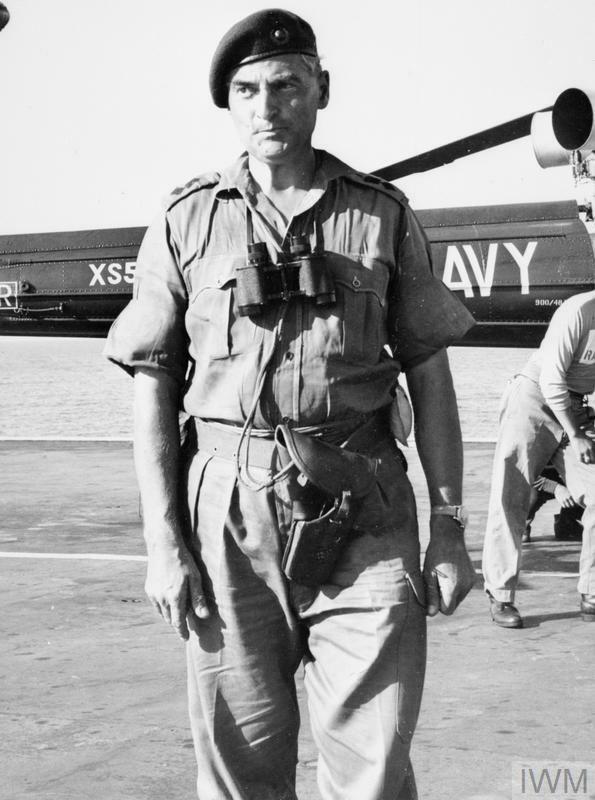 Lt Col Dai Morgan, Commanding Officer of 42 Commando, was the last British serviceman to leave Aden on 29th November 1967.